When you make this classic and homely Punjabi Saag Paneer-Spinach and Indian Cottage Cheese Curry, surely you're going to forget any restaurant style Saag Paneer or Palak Paneer, trust me because exactly that happened in my home. This absolutely delicious and finger licking Saag Paneer is prepared with truckloads of fresh mature spinach (palak), fresh homemade Indian cottage cheese (paneer) and a few basic spices and clarified butter (ghee). You can enjoy this North Indian homely and traditional Saag Paneer with roti, phulka or plain paratha. I doubt this dish needs any introduction, mention about Indian food to anyone and they will say that they may not know about any other dishes, but they have heard the word ' Saag Paneer' If you are an Indian food fanatic, I bet you must have tried Palak Paneer or Saag Paneer first thing in a restaurant or at an Indian party. If you are spinach, paneer or an Indian food fan, surely you are going to love this recipe and it will be a definite addition to your recipe file. JCO family is a huge fan of Palak Paneer or Saag Paneer, whether I make a quick version which can be made in less than 12 minutes or traditional one which takes little longer when saag paneer is on the table, no invitations or dinner bells needed. As much as we love this curry, I resist making this curry too often as it is cooked in ghee and full-fat paneer, and I choose my Vegan Kale and Tofu curry for a healthy option. But let's talk today about this homely and traditional Saag Paneer, that is packed with flavours and goodness. Saag paneer is a North Indian style of preparing spinach and Indian cottage cheese, Saag aka spinach and Panner is freshly made Indian cottage cheese. This classic version is an easy and simple recipe, can be ready in less than 30 minutes, freshly cut spinach and paneer is cooked with basic spices and onion, garlic. 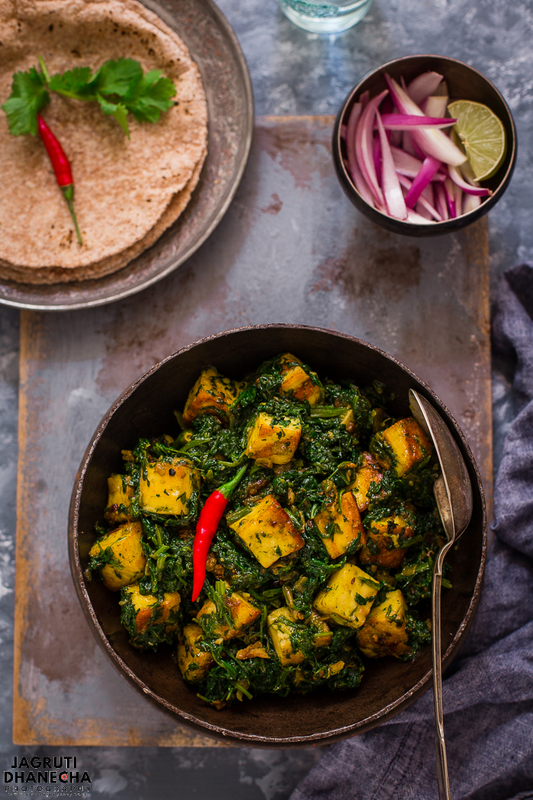 This saag paneer with plenty of flavours, gluten-free and perfect for a vegetarian dining. Usually, most of the Indian households use fresh Indian spinach aka palak, which is mature spinach with large leaves and thicker stalks and available in Indian grocery stores. Around summertime, you can get 4 good sizes bunches for £1. Only one thing that this spinach leaf comes unwashed and unprepared with dirt and you have to thoroughly wash it under the running water. So, really if you are pressed for time use baby spinach from any superstore or market. Also for this recipe, you need to chop the spinach into the size of a big confetti, rather than boiling whole leaves. For this recipe, you won't need tons of ingredients, once you have fresh spinach and paneer, you will need onion, garlic and a few basic spices such as Punjabi garam masala and ghee. Paneer and ghee don't have to be homemade. To make saag paneer, you will need to do some preparation work before you start cooking it. If you have bought palak, then thoroughly wash the leaves under the running water and remove any dirt or damaged leaves. Then cut them into small bits. Cook the spinach in a big pan with a little amount of water without covering the pan. If you have shop bought paneer, then cut into small dice and soak in hot water for 5-7 minutes. Then prepare dry masala gravy itself, the masala is prepared in ghee with garlic onion and green chillies and seasoned with turmeric, garam masala and salt. Generally, basic Punjabi gravy masala prepared with tomatoes but in this recipe, tomatoes are not used. This particular version of saag paneer is dry so I would love to serve this with garama garam (hot) roti, phulka or paratha. I am not a big fan of eating Naan with dry sabji or curries. Some people prefer to have it with hot and steamy rice too. 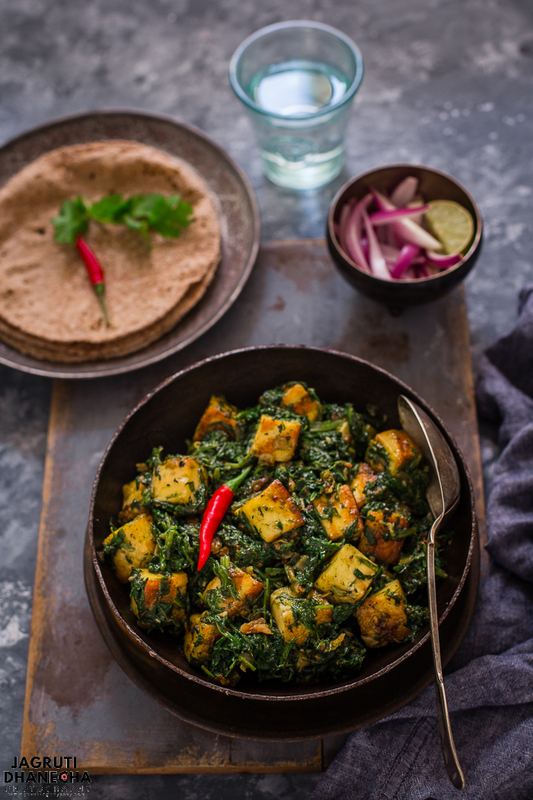 So, now you have this really easy and tasty saag paneer recipe, bookmark or pin it and don't forget to get some spinach and paneer on your next trip to the market and give this recipe a go and enjoy home-style saag paneer with your friends and family, no need for any takeaways! Punjabi saag paneer, a vegetarian and flavoursome dish that hails from Punjab, India. Prepared with fresh spinach and Indian cottage cheese. Thoroughly wash the spinach leaves under cold running water to remove any dirt, remove any damaged leaves. Roughly chop the leaves with the stalks. Place it in the pan and add less than 1/4 cup cold water. Don't cover the pan, and cook the spinach, keep an eye on the water level. Meanwhile, heat ghee in a heavy bottom pan or kadai and add chopped onion. After a couple of minutes, add ginger, garlic and green chillies. Fry this mixture on a medium to low heat for 6-7 minutes. Keep an eye on spinach. While the onion mixture and spinach are cooking, heat oil in another frying pan and add cubed paneer. Shallow fry the paneer cubes until lightly golden all the sides. Add turmeric, garam masala, salt and cumin seeds into the onion mixture and mix well. Then add shallow fried panner into the onion mixture and mix gently. Once spinach is cooked and almost all the water evaporates, mash the spinach with a potato masher. Do not make puree, but make smooth with some texture. Add into the onion and paneer mixture and mix well, reheat the curry and add lemon juice. Serve in a serving bowl and enjoy with roti, phulka or naan. If you are buying regular spinach from the supermarket, add less water as this baby spinach won't need much water. Yummy!! Look so healthy and inviting! My son loves palak paneer, albeit the one with gravy. This would be perfect in his lunch box! I like this wholesome recipe for saag paneer Jagruti. Sadly too many restaurants here serve it so loaded with heavy cream. I am inspired to make your recipe soon. I've grown up eating Saag Paneer. It is one of my favorite punjabi cuisine. I like when it's generally spicy and use a lot of butter and ghee. Yum this is, looks so so delicious. I am hungry now. Beautiful pics too. And 4 bunches for a pound, I need to shift to UK. 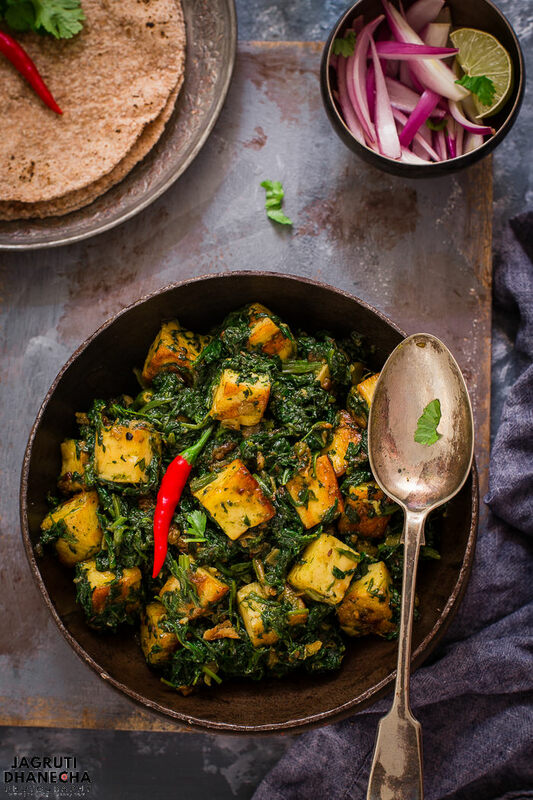 This recipe of saag paneer looks divine Jagu!! Its raining cats and dogs hear in Arizona and this is sounds perfect dish. Making this for dinner. Thanks for sharing. Saag paneer looks absolutely delicious .This is the only palak dish my family likes. Lovely share. Saag paneer looks absolutely lip smacking. This recipe is bit different from regular palak paneer. Would love to give it a try. Wonderful clicks. Thanks for sharing. palak paneer is something which any north Indian love. But saag paneer and palak paneer is different for us. Looking such a tempting dish and want to finish asap. As usual amazing clicks Jagruti. :) I am not a great saag fan but when anything made with paneer becomes my favourite. 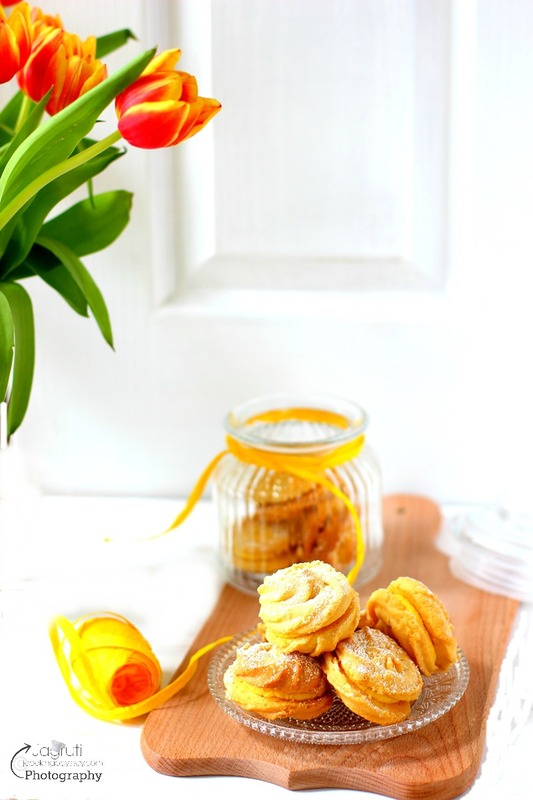 :) :) Wonderful recipe! We love aloo saag so i am sure we would love this utterly delicious and flavorful paneer saag as well. Would give this combo a try for sure. Thanks for the share Jagruti. Saag paneer sounds mouthwatering Jagruti. Amazing click. Always make palak paneer but never tried this dry Saag paneer. Its seems more easy and delicious. Lovely share. I like saag like this coarse and not the traditional runny gravy that is blended. Yummy and healthy sabzi. Oh that looks so absolutely delicious. I love saag paneer but have not made this in years. Looks so pretty with the green and golden fried paneer. Saving this for later. This sounds so fresh and flavourful. Love your photos as well, gorgeous shots. The flavors looks so deep and savory! YUM! Perfect for the fall! Palak Paneer is my hubby's go-to order at our favourite Indian restaurant! I personally find it way to greasy and will definitely try your recipe to lure him away from the take-out fare! Love the pictures as well! What a lovely recipe, your photos are so inviting. I love making Indian food so will definitely try this, it sounds delicious. I am totally unfamiliar with Indian cooking and I haven't heard of those dishes, ever. But your photos and descriptions are certainly making me want to go out and give them a try ASAP. At least now I know what the dish is when we do go into an Indian restaurant. I'm sure I'll be wanting to make it at home. Ooh I have an Indian themed dinner party coming up with some friends and have been looking everywhere for a recipe like this. Show stopping, and beautiful shots! I love paneer, and I'm always looking for ways to cook with it at home. I've had saag paneer at restaurants, but never thought it would be so easy to make at home. I love discovering new dishes like this. This looks great! I love the look of it and I'm a big fan of saag paneer so I just know I would love this!